In 1725, the early workhouse directory, An Account of Several Workhouses..., noted the existence of a workhouse at Ely. A parliamentary report of 1777 recorded parish workhouses in operation at Ely St Mary (for up to 35 inmates), Ely Trinity (80), Haddenham (40), Littleport (30), Sutton (33), and Witchford (12). In the late eighteenth century, Little Downham erected a poorhouse on the village main street. The building later became the Feoffees School and is now the village hall. County of Cambridge: Coveney, Downham (2), Ely Trinity (6), Ely St Mary's (3), Haddenham (2), Littleport (3), Mepal, Stretham, Sutton (2), Thetford, Wentworth, Wilburton, Witcham, Witchford. Later Additions: Grunty Fen (from 1858), Redmere (from 1895), Witcham Gravel (from 1894). The population falling within the Union at the 1831 census had been 17,327 ranging from Wentworth (population 144) to Ely Trinity (4,325). The average annual poor-rate expenditure for the period 1833-35 had been £13,777 or 15s.11d. per head. 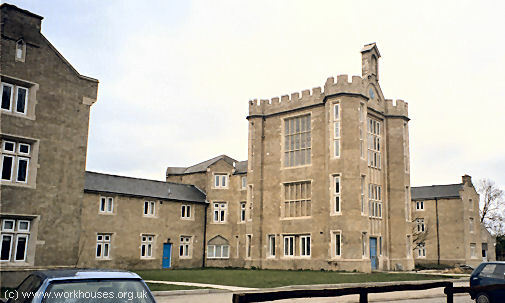 Ely Union workhouse was built in 1836-7 to a design by William Donthorn, who was also responsible for Aylsham in Norfolk amongst a number of others in eastern England. It was built to accommodate 300 inmates and cost £7,000. The building contractor was John Sugars of King's Lynn. At the front, to the east, was the impressively handsomely three-storey administration block, with the old women's yard on at its north side, and the old men's yard to its south. To the west of each yard respectively, were the two-storey old women's and old men's accommodation blocks. Ely from the north-east, 2000. Ely from the south east, 2000. At the north-west, to the rear of the rear of the old women's block, was the females' yard divided diagonally with one half for young women, the other for girls. The males' yard to the south-west was similarly divided. To the rear of the main accommodation blocks stood two infirmary blocks which were erected in 1839. The larger of these, to the north, was for women, with the men's infirmary in a separate block to the south. 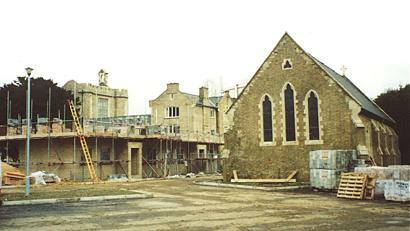 Ely from north-west showing women's yard and infirmary, 2000. A chapel was built at the south-east of the site. In 1912, the workhouse became officially known as Ely Poor Law Institution, then as Ely Public Assistance Institution from 1930. With the Advent of the NHS in 1948 it became Tower House Hospital, then just as Tower Hospital. 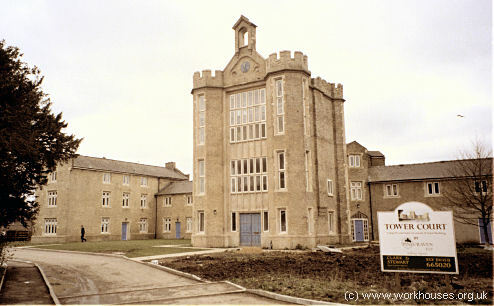 It finally closed in 1993 and, as the pictures show, was recently redeveloped as private housing under the name of Tower Court. Cambridge Archives and Local Studies, Box SH 1009, Shire Hall, Castle Hill, Cambridge CB3 0AP. Holdings include: Guardians' minute books (1878-86, 1891-5, 1920-2, 1928-30); Creed register (1876-85); Mental defectives register (1924-49); Chapel services register (1912-58); etc. Denton, A (1986) Ely Union Workhouse.